Lagerstroemia, also known as Banaba, is a plant whose leaves have been used for anti-diabetic purposes. It contains a variety of molecules such as corosolic acid which may confer benefit to glucose control. Our evidence-based analysis on banaba leaf features 28 unique references to scientific papers. It can inhibit uptake (digestion and absorption) of carbohydrates to a degree, and can also aid in their deposition into cells from the blood stream (resulting in a reduction in blood sugar). You are now following Banaba Leaf. You will be notified when any significant update is made. An oral supplement of 3,000mg of the leaf extract from Banaba appears to be used with efficacy. Other Banaba supplements may have concentrated supplements which increase the corosolic acid content, in which a 2:1 extract of 1,500mg would be equivalent to the 3,000mg leaf extract. Although the above dose is currently recommended, it is not known if this is the optimal dose or not. Furthermore, it is not known whether or not this supplement needs to be taken with meals (although it is recommended out of prudency for the purposes of helping glucose tolerance to take it with meals). The Human Effect Matrix looks at human studies (it excludes animal and in vitro studies) to tell you what effects banaba leaf has on your body, and how strong these effects are. The reduction in blood glucose appeared to range from 20-30%, which is more than usually seen with dietary supplements. Banaba leaf (of the family Lythraceae) is a term used to refer to the genus of Lagerstroemia, commonly referred to as Crape myrtle.) The supplement sold as 'Banaba' tends to refer to the species of Lagerstroemia Speciosia (Giant Crape Myrtle, Pride of India, or Banaba) with the species of indica or fauriei also being sold at times. 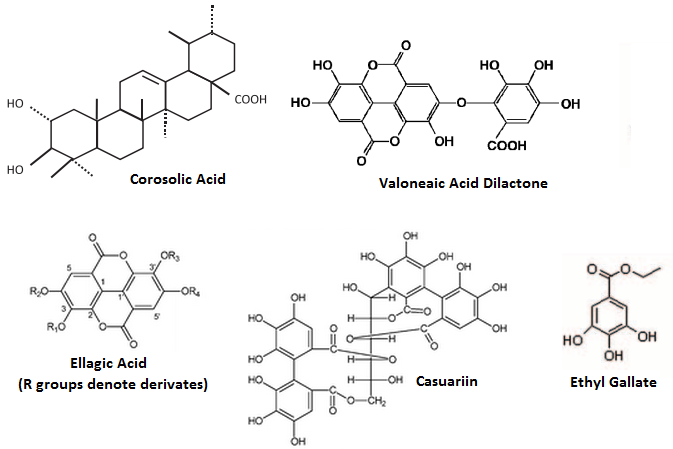 The content of Valoneaic Acid (VA) in Banaba leaves can be increased by roasting (15 minutes at 170°C) from 0.057% to 0.184% the weight of the dry leaves (222% increase), and VA can be produced by the breakdown of the compounds Lagerstroemin, flosin A, and reginin A.
Extracts of Banaba appear to have anti-oxidant effects, which have been confirmed in the serum of rats fed 50-500mg/kg Banaba leaf (1% Corosolic Acid) over 60 days. In vitro tests suggest this extract has an anti-oxidant potency (measured by ABTS+) of 0.012umol of Trolox equivalents per gram. The fruits also have anti-oxidant potential, which is comparable to some other fruits although not inherently remarkable in potency. Following oral administration of 20mg/kg Ethyl Gallate (a polyphenolic in Banaba leaves) to rats, a Cmax of 544.02+/-274.22ng/mL is reached at a Tmax of 6.17+/-2.23 minutes with a half-life of 11.90+/-4.37 minutes (AUC to infinity of 9418.38+/-4378.01). A metabolite, gallic acid, appears in plasma after 12 minutes (Tmax) with a maximum concentration (Cmax) of 175.13+/-45.22ng/mL and a half-life of 34.01+/-11.51 minutes. The anti-inflammatory effects of Banaba appear to extend to the heart, where in isolated Hc92 cardiomyocytes concentrations of Lagerstroemia Speciosa between 0.25-1mg/mL are able to reduce the nuclear activity of NF-kB induced by TNF-α, with 1mg/mL effectively abolishing NF-kB activation. When looking at fractions of Banaba leaf the acetone, ethanolic, butanolic, and water extracts all appear to have similar inhibitory potential on the alpha-myalse enzyme (35-50% inhibition at 200ug/mL in vitro) with a fraction containing 24% Valoneaic Acid Dilactone (VAD) reaching near 100% inhibition at 200ug/mL. VAD and Valoneaic Acid (VA) appear to be highly correlated with alpha-amylase inhibition from Banaba Leaf. Triterpenoids have failed to exert any significant inhibition of alpha-amylase. Alpha glucosidase may also be inhibited by triterpenoid compounds, with Corosolic Acid being most potent (IC50 of 3.53ug/mL; uncompetitive inhibition) with notable inhibition coming from Maslinic Acid (5.52+/-0.19μg/mL) and Oleanolic Acid (6.29+/-0.37μg/mL) with the ethyl acetate fraction itself tested being 88.72+/-1.02μg/mL. One other study has noted that the extract itself has an IC50 of 0.3μg/mL, suggesting other compounds may be contributing beyond Corosolic Acid. One acute study using 10mg Corosolic Acid (99% pure) given 5 minutes prior to a 75g Glucose Tolerance Test in humans noted that at 60-120 minutes post-ingestion that there was reductions in blood glucose and that the 90 minute time point was statistically significant. An ellagitannin from Banaba, Lagerstroemin, appears to act as an agonist of the insulin receptor. A such, it works via PI3K and is inhibited by Wortmannin. A study in streptozotocin-induced diabetic mice given an extract of Banaba standardize to 1% Corosolic acid (50-500mg/kg bodyweight) for 2 months noted that measurements at 10 days or sooner failed to show any benefit but that all doses reduced blood glucose concentrations at day 15 and maintained similar potency up to day 60. Isolated Corosolic acid from Banaba at 0.023% of the diet in KK-Ay diabetic mice noted reduced serum (32%) and hepatic (46%) cholesterol concentrations after 10 weeks. Corosolic acid is the bioactive which is thought to mediate most effects of Banaba leaf due to its high concentration and known bioactivities. Glucosol, a patented blend of Banaba, appears to be able to reduce blood glucose in the serum of diabetic rats within 90 minutes of administration. One human study (not located online, but noted in this review as citation 19) notes that oral administration of Banaba Leaf over a year in pre-diabetic persons (glucose greater than 110mg/dL) was associated with a 16.6% reduction in blood glucose with no reported hypoglycemia nor adverse effects. One study using the Brand name product 'Glucosol' (no funding from company producing Glucosol) noted that 32-48mg of this product standardized to 1% Corosolic Acid was able to reduce the blood glucose of Type II Diabetics after 15 days in a dose-dependent manner. The degree of reduction was 3.18-4.9% at 16mg (failed to reach statistical significance), 6.5-10.7% at 32mg, and 20.2-30% at 48mg; oddly, soft gels appeared to be more effective than hard capsules. There is also apparently an unpublished study (again mentioned in a review of human trials) where a soft gel of Banaba leaf (10mg Corosolic Acid) was used over 30 days in prediabetics or type II diabetics and resulted in 10% reductions of blood glucose (fasting and postprandial) relative to placebo. Other studies include a trial using a product blend (Banaba Leaf, Green tea and coffee (for green tea catechins and chlorogenic acid respectively) and Garcinia Cambogia) noted reductions in blood glucose of 13.5% with no significant influence on HbA1c, Fructosamine, Insulin, Total cholesterol, HDL-C, Triglycerides, Leptin or Body Weight in persons with high serum glucose (n=20). One other highly confounded study exists where over 12 weeks participants consumed Banaba (16mg), Bitter Melon (100mg), Garcinia Cambogia (1500mg, 60% HCA), Gymnema extract (133mg) Black Pepper extract at 1.6mg, and the dietary minerals Magnesium (50mg), Vanadium (50mcg), and Chromium (167mcg) which preceded a weight loss of 6.29kg. The tannin structures appear to be able to increase glucose uptake in isolated rat adipocytes via GLUT4 translocation, with Lagerstroemin, flosin B, and reginin A being unique bioactives in Banaba shown to do so, with tannic acid itself being a contributing factor. At a concentration of 0.04mg/mL, a few tannins showed potency in inducing glucose uptake similar to 100nM insulin (Flosin B, Stachyurin, Casuarinin, Lagerstroemin, and 2,3-(S)-hexahydroxydiphenoyl-α/β-D-glucose), with all tannins reaching maximal glucose uptake in the range of 24-49% at concentrations below 1mg/mL. A hot water extract of Banaba still exerts glucose uptake effects to a lesser potency than insulin (due to less concentration of bioactives) and there do not appear to be additive nor synergistic effects with insulin itself. Corosolic acid has also been shown to induce GLUT4 mobilization in adipocytes and other cells. At least one ellagic acid derivative (3-O-methylellagic acid, of which ellagic acid passively degrades into) has been noted to suppress glucose uptake. In regards to adipocyte proliferation, the proliferation of adipocytes (with 100% set as control) is reduced at a concentration of 0.1mg/mL to 62-64% with either 3-O-methyl-ellagic acid 4'-sulfate or 3,4,3'-tri-O-methylellagic acid and is reduced to 38% with 3-O-methylellagic acid; these inhibitory effects are lost at 0.5mg/mL. In 3T3-L1 adipocytes, a basic Banaba Leaf hot water extract has shown these suppressive effects on fat cell proliferation in the presence of corticosteroids and insulin in vitro at 0.1-0.25mg/mL. ^ Glucosol Effect on Blood Glucose in Rats. ^ Effectiveness and Safety of Banabamin Tablet Containing Extract from Banaba in Patients with Mild Type 2 Diabetes. ^ Weight Loss, Body Measurements, and Compliance: A 12 Week Total Lifestyle Intervention Pilot Study. ^ Tannic Acid Stimulates Glucose Transport and Inhibits Adipocyte Differentiation in 3T3-L1 Cells.